Hub wrote a number of reminiscences and stories about growing up. After Hub's death, his friend, Bill Spencer, decided that Hub's writings needed to be published and self-published this wonderful collection Across this Silent Canvas. You can order it here! 232-pages, original high quality paperback on acid-free paper. Text of the above image copy for the bots: Across this Silent Canvas: a creative lfe, by Hubbard Miller. 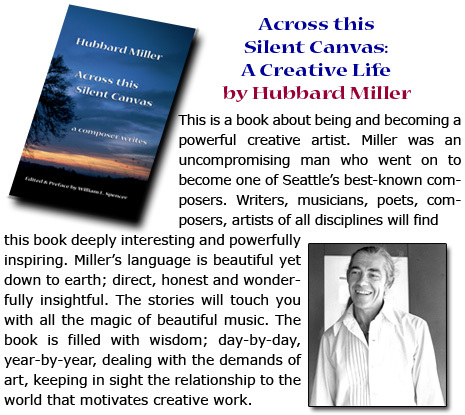 This is a book about being and becoming a powerful creative artist. Miller was an uncompromising man who went to become one of Seattle's best-known composers. Writers, musicians, poets, composers, artists of all disciplines will find this book deeply interesting and powerfully inspiring. Miller's language is beautiful yet down to earth; direct, honest and wonderfully insightful. The stories will touch you with all the magic of beautiful music. The book is filled with wisdom; day-by-day, year-by-year, dealing with the demands of art, keeping in sight the relationship to the world that motivates creative work.